Team USA lead Jaqui Kapinowski has announced her retirement from wheelchair curling. 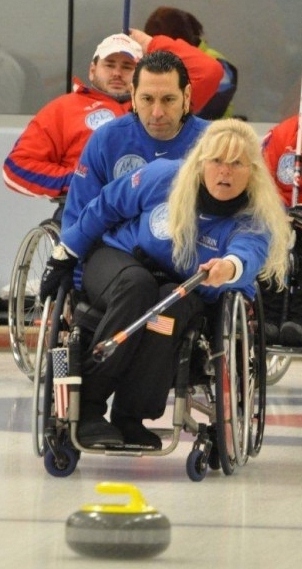 In an email sent to friends and supporters she said that though it was a very difficult decision, she had decided it was time for her to return the support of her husband over the past 20 years of a sports career covering wheelchair athletics and curling, by making a permanent move to their home in Florida. "Please know how much I truly care for each of you, everyone has been so supportive over these years. Marc (Deperno), I owe you so much for getting me involved in this sport. It has been one of the greatest experiences of my life. I want to end by thanking the USCA for their sponsorship & most of all the friends I made..... I'm truly sorry, I love you guys so much!" Jaqui joined Team USA in 2007 and earned a bronze medal as lead at the 2008 World Championships. A performance drop-off at the 2011 Worlds was in part due to her difficulty in finding practice ice time. She maintains an interest in wheelchair marathons and rowing. Her retirement opens the door for Wisconsin's Penny Greely, who was Team USA's 5th player at the 2011 Worlds. JACQUI is one of greatest people in Wheelchair curling. She always has a smile and is willing to take some time for her friends. I will miss her. Please keep in touch with all of us. A note to Eric or any of us to let us know what you are up to would truly be of interest to us all. I know how difficult this decision must have been. She will be missed on and off the ice-she was so bubbly and you always knew she when was around. Her Scottish connection is very important to her and I shared many an hour talking about her roots in Scotland. We recall when she first started "wheelchair curling" she very quickly honed her skills and became one of the best lead players in the World. Her enthusiasm and support for her team-mates was always eveident on the ice. Aileen and I wish her and Harry good health in the future.